Two months ago, I was warned that my article for the July issue would be about my first memories of Disneyland. I knew from the outset how hard this would be. If I had been asked about my first visit to Florida's Magic Kingdom this would be easy. It was November 18th 1988, which was Mickey's 60th birthday. I could write reams about my memories: the parades; my first trip on a monorail; finding coins in my rocket on Space Mountain; being scared of the Queen in Snow White's Adventures (the word "Scary" was not added to the now-closed-for-good WDW ride until 1994); being surprised that Dad let me go on Mr. Toad's Wild Ride in a separate car to him and Mum (this attraction has since been replaced by The Many Adventures of Winnie The Pooh); and falling asleep during The Hall of Presidents. The first attraction I went on at the Magic Kingdom was Pirates of The Caribbean, and the first thing I ate there was a brownie at Casey's Corner. I remember this snack distinctly, because whilst eating it, my Dad was requesting the pianist play God Save the Queen. My father wasn't particularly patriotic, nor was he missing the U.K., he was just being difficult. Likewise, I could tell you about the day I first visited EuroDisney (as it then was). This was September 28th 1993; the day before my 11th birthday. The four day trip was a surprise, and my memories include: seeing advertising for the forthcoming Discovery Mountain (which opened in 1995 as Space Mountain); putting off going into Phantom Manor for as long as possible (for reasons which I will cover in a later issue); my Mum claiming BTM was so tame in comparison to the US versions that she could do her knitting on it (which she did in subsequent visits); and running into Brian Henson outside Cinemagique. (NB, Cinemagique was the original name of the theater housing Captain EO and is not to be confused with CineMagique, a current attraction in Walt Disney Studios). The first attraction I visited at EuroDisney was La Taniere du Dragon featuring what was then the biggest audio-animatronic figure ever created; the first thing I ate was an Unbirthday Cake at March Hare Refreshments. I have never eaten healthily at theme parks. I could also tell you the first attraction I went on, the date and the first food/place I ate at Disney-MGM Studios, Disney's Animal Kingdom, Disney California Adventure, EPCOT Center and Walt Disney Studios. (I am using the names here that these parks had when I first visited them). The same could be said of various non-Disney Parks as well. Nonetheless, I couldn't for the life of me tell you the first thing I went on, when I first went to Disneyland Park (California) in 1995. The exact date escapes me. However, I remember vividly what I ate at the park that day: nothing. My Dad had forced me to eat as much as possible at the free hotel buffet that morning, so I was absolutely starving in the evening when we left the park and went to a Chinese Restaurant in the evening. Apropos of nothing, at both the buffet and the restaurant, my Dad spilled orange juice on his trousers. He claimed the former was due to excitement, and the latter was caused by tiredness. Seeing as most of my articles are comparisons, which could be written as lists (but aren't), I thought I would break my own tradition by presenting the majority of this musing in list form. *	Being confused by the necessity of a Fantasyland Autopia in addition to the one in Tomorrowland. *	Being amused/incensed by the nearby hotel which had the nerve to call itself Dizni Vu. *	Being able to see Matterhorn Bobsleds and Space Mountain from the car driving between the airport and our hotel, The Castle Inn. *	My Dad requesting a joke on the Jungle Cruise that he'd heard on the Florida version and was worried would not be included in the California script: "Please get off the way you got on pushing, arguing, fighting, spitting, avoiding eye contact "
*	Being disappointed by the existence of Pinocchio's Daring Journey, having thought that a Pinocchio ride was exclusive to Paris. *	A Cast Member working the Tomorrowland Autopia amusing those in line with a seemingly impromptu quiz. I still have the sticker I "won" for answering all questions correctly. *	Maynard's finger puppets on Haunted Mansion (although I didn't know who he was at the time). *	Finding out (and being surprised) that the Carousel Theater had been closed to the public for seven consecutive years at that point. *	Being disappointed by Pirates of The Caribbean not being housed in a Fort (as per Paris and WDW), as well as the fact that it ended with an up-ramp and then a scene visible from the queue-line. *	My father preparing me for my visit to Disneyland, telling me about the purpose of the Berm (and claiming that, without it, we would be able to see banks from inside the park). He also said that in many ways it was identical to the one in Florida, right down to the Tiki Carvings. *	Feeling that various attractions weren't "right". For example, the castle seemed too small, the animatronics on Splash Mountain felt too "cartoony" and the exterior of It's A Small World being outside rather than inside. 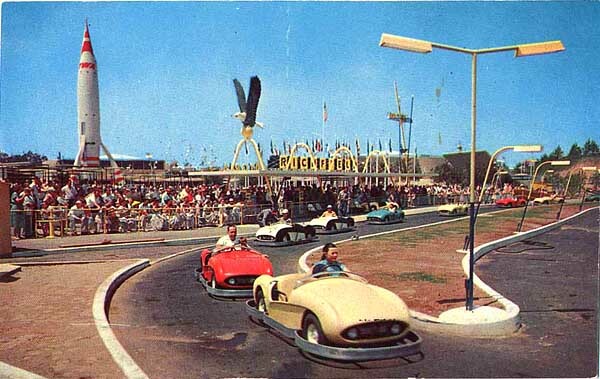 Since then I learned that, seeing as Disneyland had these attractions first, if anything, the ones in WDW were "wrong". *	Going on Alice in Wonderland and being reminded of Blackpool Pleasure Beach, and wondering who nicked the idea from whom. *	Going on Roger Rabbit's Car Toon Spin (which had opened the previous year) and learning to appreciate the theming of the waiting area. In fact, in future visits, I have often waited till later in the day to go on this attraction because when it opens in the morning they tend to let you straight on, and don't wish for you to go round the full line. *	Going on Indiana Jones Adventure: Temple of the Forbidden Eye which had opened less than six months previously. This was back when one was given Decoder Cards, when you got in line, and also when the Cavern of Bubbling Death had a functioning Crumbling Ceiling; both details I sorely miss and am disappointed that some current Cast Members on the attraction have not even heard of these details. *	Finding it ironic that Skippers on the Jungle Cruise were referring to the above attraction as the Temple of the Four Hour Line when the longest wait I had all day was for the Jolly Trolley (back when it was in operation). *	Finding it odd that Star Tours was so near to Space Mountain when (based on my experiences in Florida) I felt they should be in separate parks. At the time, I hadn't been on the equivalent of the latter in France (although it was open) and I felt the two voyages to outer space seemed to cancel each other out. *	Comparing Haunted Mansion to its Florida counterpart. Dad had claimed that the only differences were that the stretch room operated the "other way" and that the one in California therefore had to end with an escalator. I remember insisting on going on it again to point out the other ways in which it differed. I was quite proud of the ones I came up with, but am pretty sure I could list ninety more now. The only difference I currently remember observing at that time however was that there were fewer clues in the audio in the attic scene as to when a ghost would "pop up", thus making that version of the scene the scarier of the two for me. What struck me the most whilst compiling the above list is that seeing as Disney made such a big thing of its 50th anniversary (making it last 18 months) and, to a lesser extent, its 55th, I am surprised that I remember nothing in terms of "celebrations" tying in with its 40th. I remember reading about the capsule which had been buried earlier that year, but nothing further sticks in my mind. That, if nothing else, marks it out as the Disneyland of yesteryear. Writing this article was a trip down memory lane for me. It made me think of attractions which were there then and are no more (Country Bear Vacation Hoedown, Circle-Vision 360, Submarine Voyage, Golden Horseshoe Variety Show, Swiss Family Treehouse and The Lion King Celebration Parade) and also about some of the changes good and bad- made to attractions which still exist but have changed beyond recognition since then. It was also a chance to speak to friends and family about their recollections in the hope these inspired me to remember more, and to watch them relive the magic themselves. I look forward to hearing your memories.